Our family had always loved Japanese food, and basically most things Japanese! 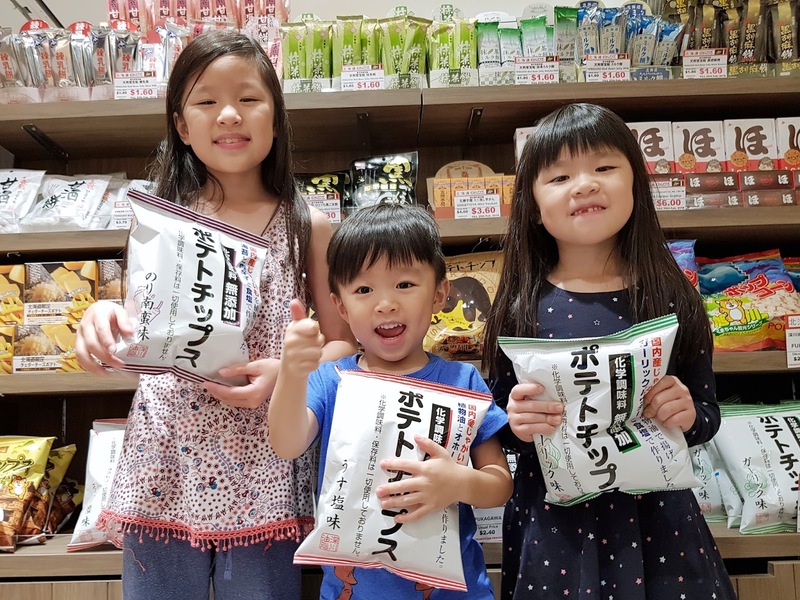 Ramen and udon are the kiddos' favorites, and they had also been having sashimi since young! If given a choice, I am pretty sure that they would want to have them for every meal! The last time (and only time actually) that our family visited Japan was 3 years back. I can still recall my fascination with their many beautiful confectionery that looked good and tasted great! 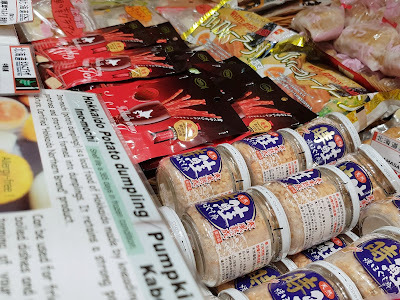 Just over the last December holidays, many friends popped by Hokkaido and raved about the great the great snow-clad sceneries and the FOOD! 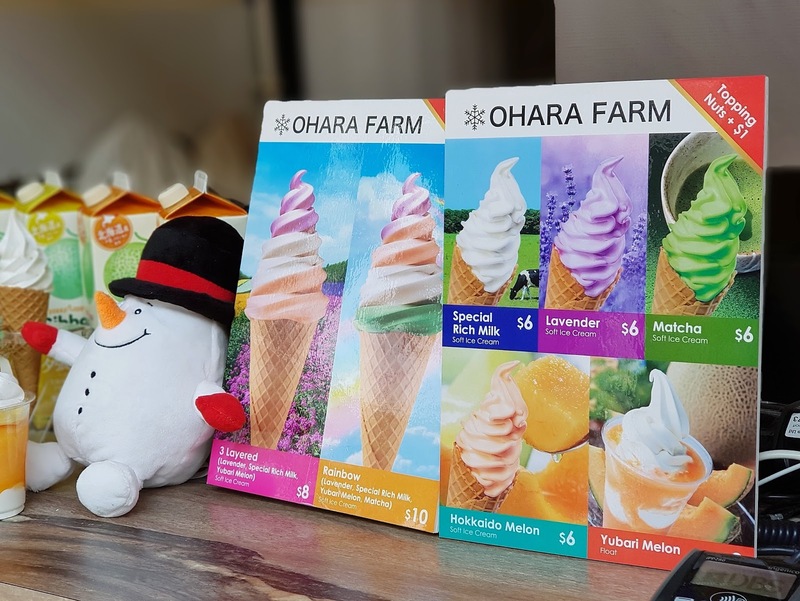 The freshness of the seafood and the experience of eating soft-serve Hokkaido milk ice-cream in winter! It made me so jealous of them and I wonder when it would finally be our turn to experience it. 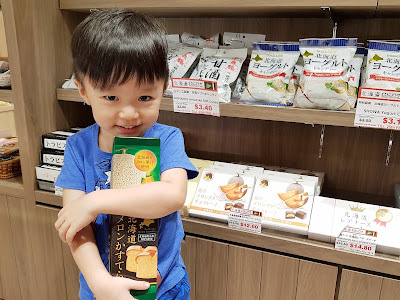 But before we actually make the trip to Hokkaido, we can definitely try some of their goodies here in Singapore! It is no secret that Liang Court caters largely to our local Japanese community and of course to all those who loves all things Japanese as well. 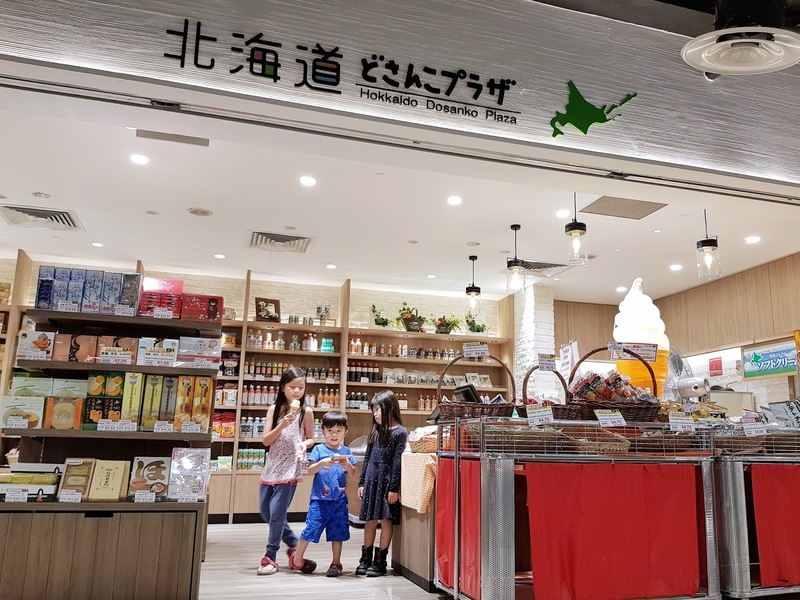 The Hokkaido Dosanko Plaza located within Meidi-ya Supermarket at B1-31, features a wide variety of best-selling confectionery from Hokkaido and boosts a wide selection of over 250 types of products from the prefecture. We browsed through the shelves and were introduced to many famous brands and top-selling goodies in this Hokkaido local specialty shop. 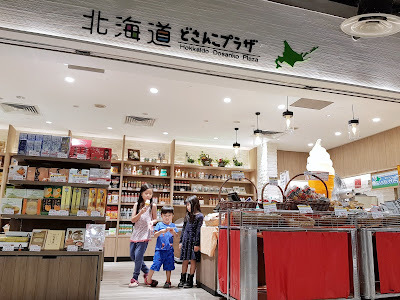 This would be a great place to find the local products that you had been sorely missing since your last holiday trip, or to get a real taste of Hokkaido even before flying over! 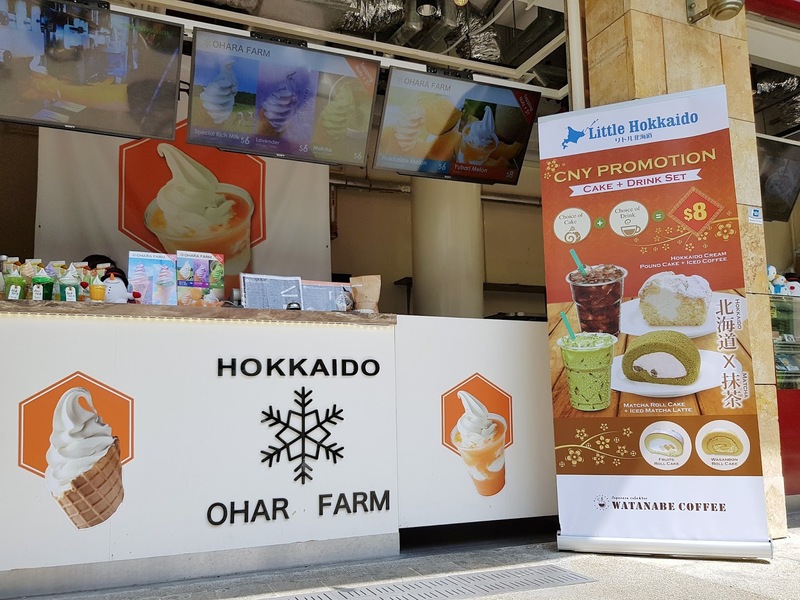 Do yourself a favor and get a Hokkaido milk soft-serve cone while you are there too, as they were really delicious! 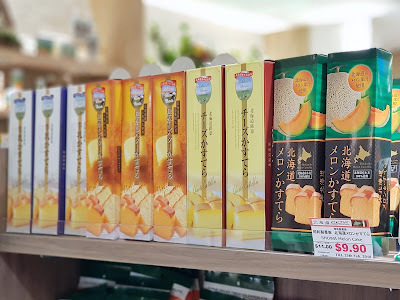 These Melon Castella cakes are simply delicious and flavorful! 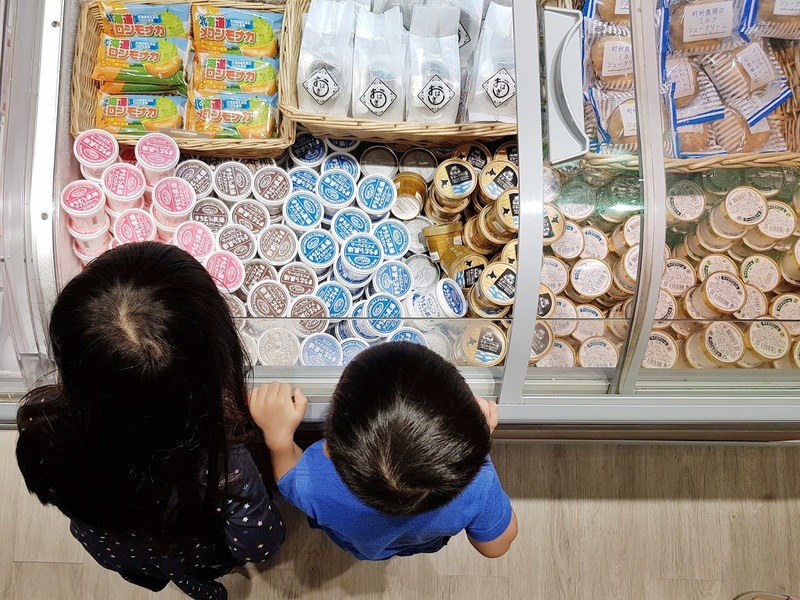 Choose from a variety of flavors, including cheese or original! 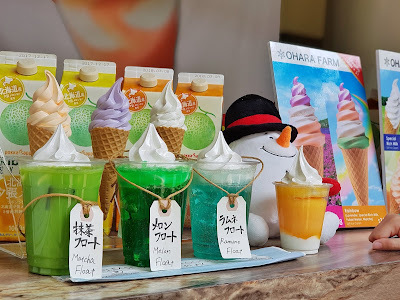 Yummy soft-serve ice-cream made from real Hokkaido Milk! Oh and do you know that a little Hokkaido corner had popped up on The State of Fun, Sentosa island not too long ago? Step out from Waterfront Station and look right for the rows of 3 shoplets, namely Ohara Farm (Ice Cream), Watanabe Coffee (Cakes & Drinks) and Hokkaido Sushi Bar (Sushi) that makes up the Little Hokkaido. 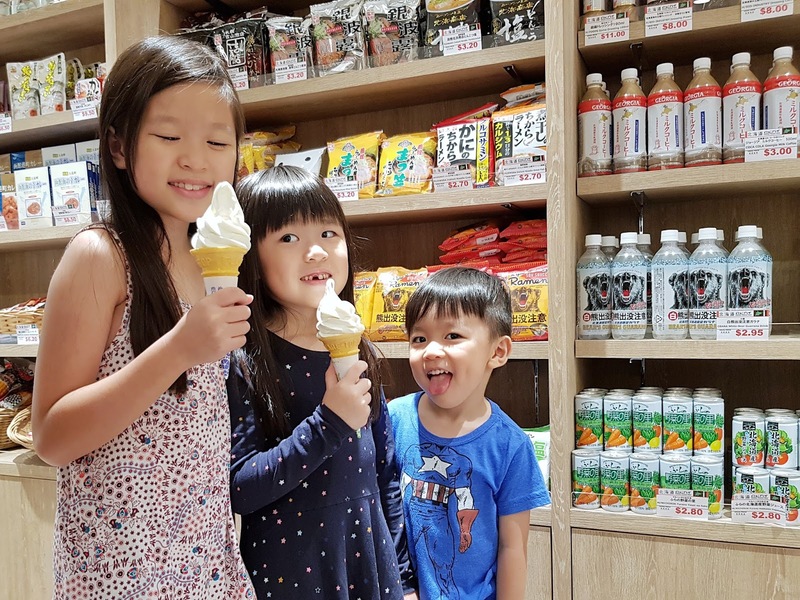 We visited that over the weekend and were treated to some pretty awesome Japanese fares! 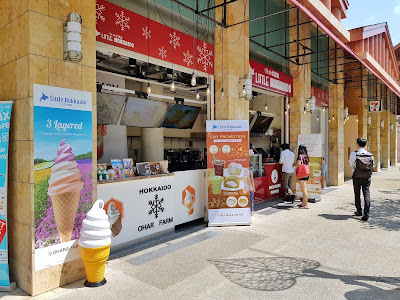 We all know how the weather can ridiculously HOT at times, and we found that a serving of Hokkaido soft-serve or a cup of ice-cold coffee could do wonders! 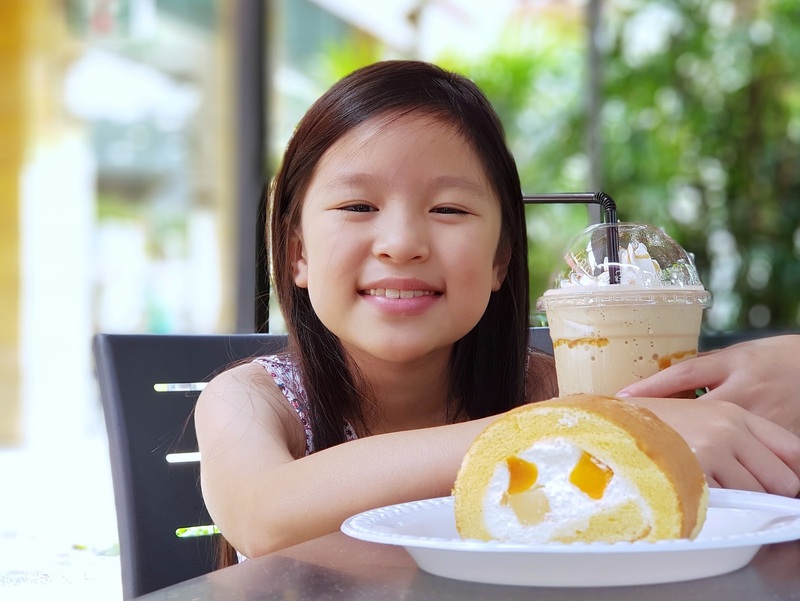 Grab their special $8 CNY promo set which consists of a slice of cake and your choice of iced coffee or iced matcha latte which you are there. Or you can also choose to upgrade your drink to a frappuccino for $2 more. 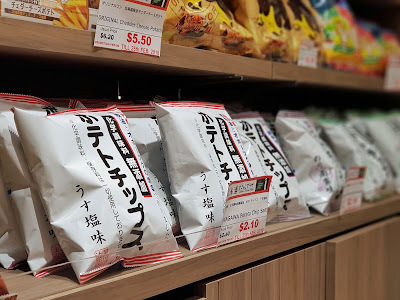 They do carry a range of Snaffle's catch cakes that were really soft, cheesy and suits my sweet tooth just fine! Walk out from the Waterfront Station. 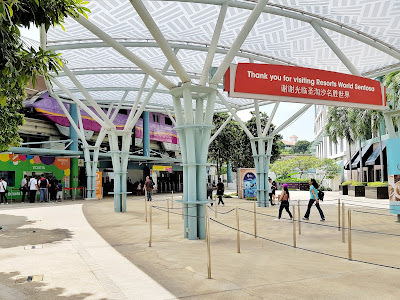 Follow the delicious-looking banners on the left. 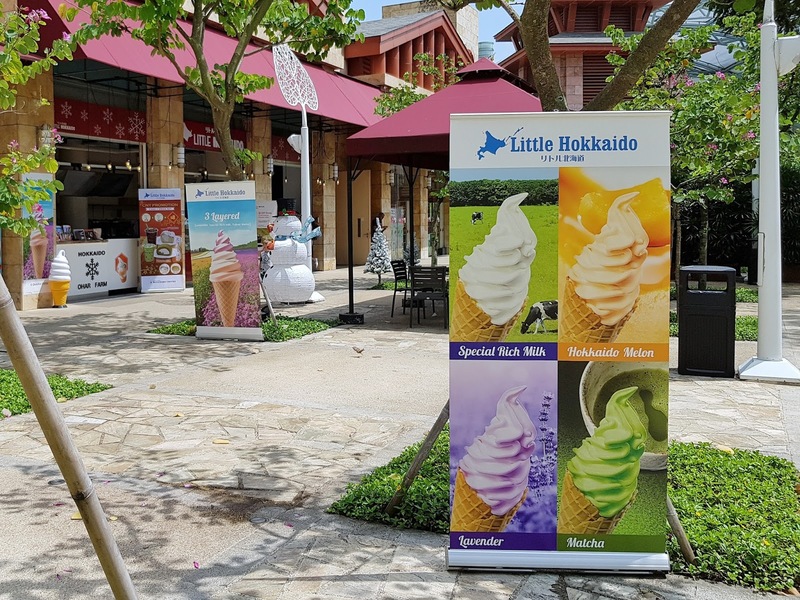 And you will this little corner called Little Hokkaido! Lots of desserts, all made with authentic Hokkaido ingredients! Melon is a must try but Steffi was attracted to Lavender but I ended up finishing the flower-infused ice-cream for her! Check out their $8 CNY Promo happening right now! 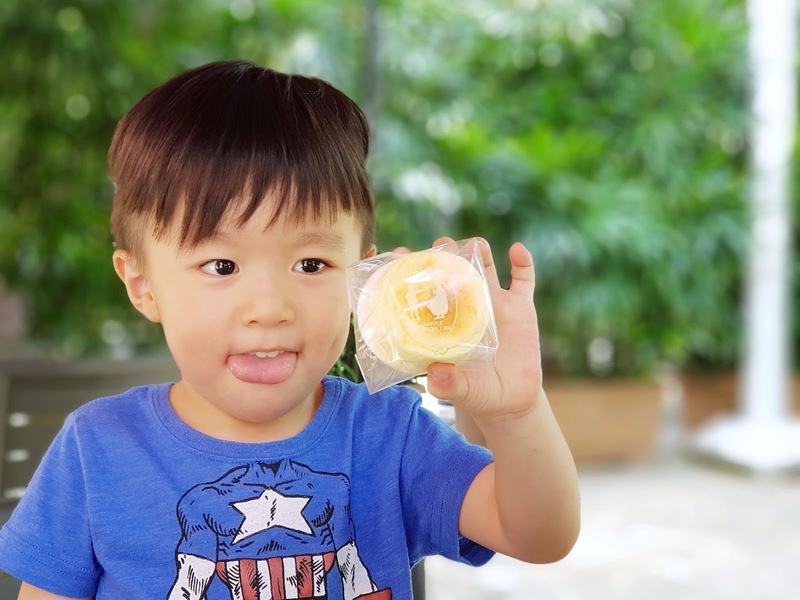 Soft and cheesy Snaffle catch cake! Steffi went along with the promo set, but we upgraded to a frappuccino! 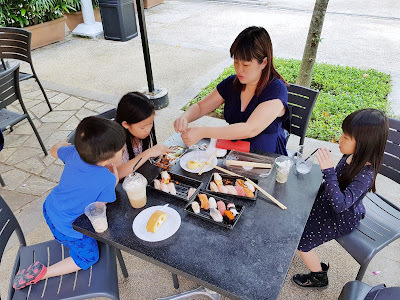 Our family had the great pleasure of trying out their oishi sushi sets, even though the sushi bar was not opened to public yet. The island is not exactly known for cheap food, but the sushi bar does serves up great tasting sushi that were not that detrimental to my wallet! I would totally describe the experience as restaurant quality food at supermarket takeaway prices. BUT take note that there are only 3-4 sets of tables and chairs in the alfresco dining area. 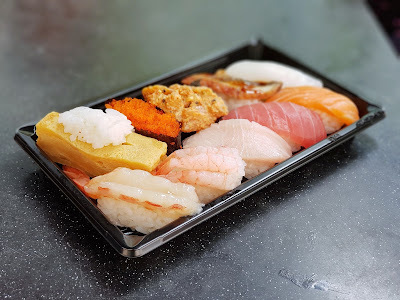 The boss also explained to me that this would be exactly how the sushi rice tasted in Hokkaido, as they followed the exact proportions of the rice and vinegar etc. The Japanese embraces technology and in this small bar, the pressing of the sushi rice is actually automated, with each equally-sized rice piece then lovingly topped up with the right ingredient by the chef. It was productivity without the loss in quality but I am really no sushi connoisseur, hence I would not have noticed any difference if I was not told. 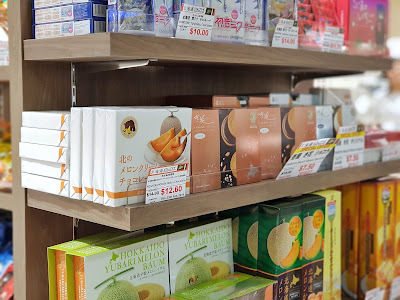 There are many sets to choose from, with price ranging from $8.90 (Tamago Inari Set, 8 pieces) to $22.40 (Hokkaido Set, 10 pieces) if you feel like indulging in premium seafood. 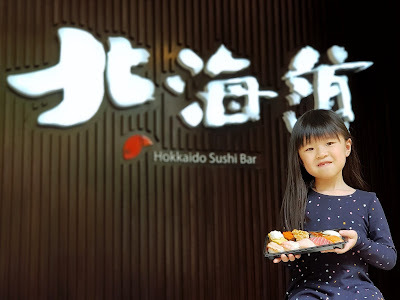 The Hokkaido Sushi Bar serves Sushi sets, Chirashi Don and Temaki too! 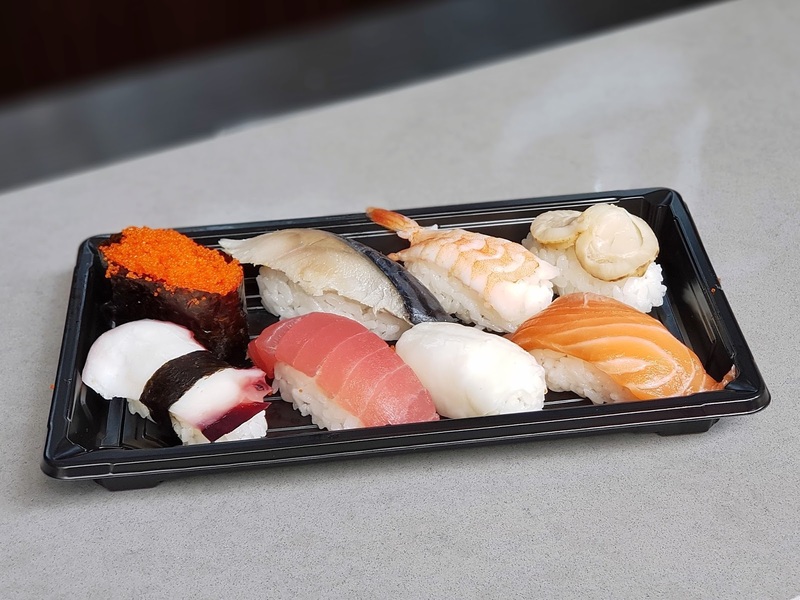 Authentic Set ($12.60) - Salmon, Maguri, Tako, Saba, Hotate, Ebiko Gunkan, Ebi and Ika. Grab yourself a seat in the dining area in front of the stalls and enjoy the feast! 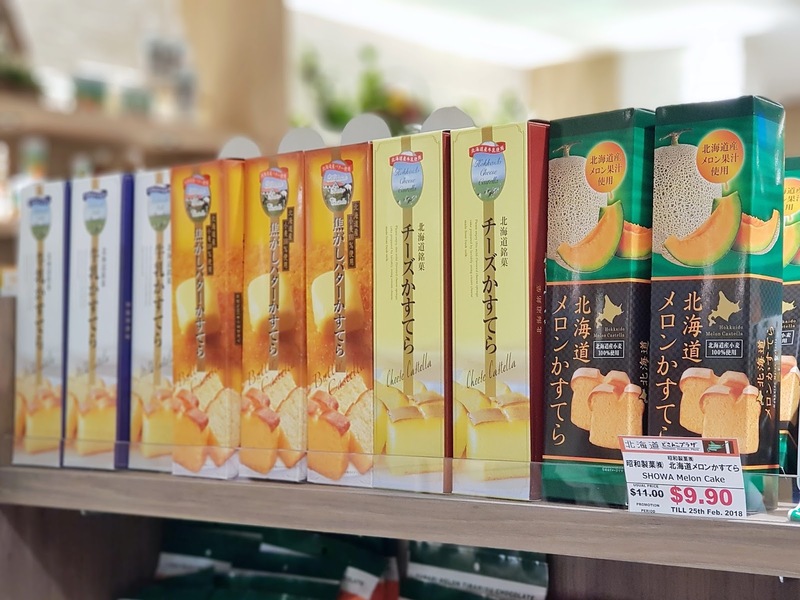 So there you have it, now you know exactly where you can find authentic Hokkaido goodies without the need for air-tickets! But if you insist on tasting them personally in Hokkaido, you can also try winning yourself a trip there simply by visiting the Hokkaido Smile campaign at https://www.passp.asia/hokkaido and filling up a simple survey there. For travel enquiries to Hokkaido, feel free to check with Hokkaido Government Representative Office based in Singapore or visit http://www.hokkaido-asean.org! This post is brought to you in partnership with the wonderful folks from Little Hokkaido.